Doctor He Yong, director of the UN's China Study Programs, delivers a lecture on promoting Chinese culture to the world at the headquarters of the Phoenix Publishing and Media Group in Nanjing, Jiangsu province, on March 28. 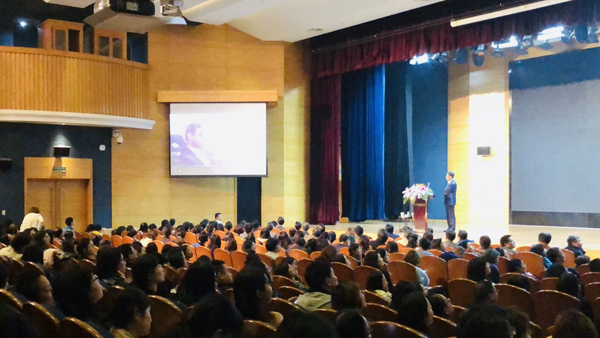 At the invitation of Phoenix Publishing and Media Group (PPMG), Doctor He Yong, director of the UN's China Study Programs, delivered a lecture on promoting Chinese culture to the world on March 28. Liang Yong, chairman of PPMG, extended his gratitude to Dr. He for his customized lecture, particularly its rich content on the UN, the world's largest intergovernmental organization, which helped PPMG members broaden their horizons and deepen their understanding. Dr. He said the UN is, as always, a place to maintain international peace and security, develop friendly relations among nations, achieve international cooperation, and harmonize the actions of nations. It is also a center for UN staff members to organize cultural and academic activities. Dr. He said he is willing to work as a cultural messenger alongside PPMG and make concerted efforts to promote Chinese culture overseas. They also talked about PPMG's recent plans to host cultural and artistic activities in the United States, as well as the possibility of carrying out cooperative projects with the UN. Dr. He is director of the UN's China Study Programs and a part-time professor at New York University. He worked as director of the UN Chinese language section from 2002 to 2017 and has twice claimed UN 21 Awards, first in 2004 and again 2014, for his innovation, efficiency and excellence in the delivery of the UN's programs and services.